WASHINGTON, D.C. -- The percentage of U.S. workers in 2015 who Gallup considered engaged in their jobs averaged 32%. The majority (50.8%) of employees were "not engaged," while another 17.2% were "actively disengaged." The 2015 averages are largely on par with the 2014 averages and reflect little improvement in employee engagement over the past year. The 2015 employee engagement average is based on Gallup Daily tracking interviews conducted with 80,844 adults working for an employer. Gallup categorizes workers as "engaged" based on their ratings of key workplace elements -- such as having an opportunity to do what they do best each day, having someone at work who encourages their development and believing their opinions count at work -- that predict important organizational performance outcomes. 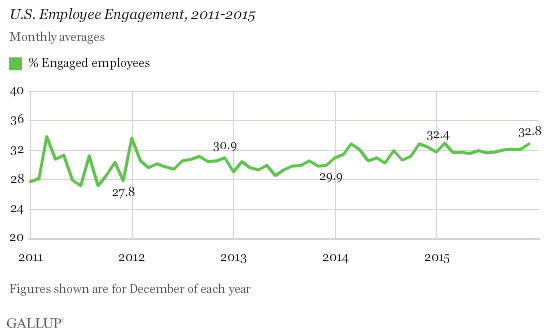 Yet, most U.S. workers continue to fall into the not engaged category. These employees are not hostile or disruptive. They show up and kill time, doing the minimum required with little extra effort to go out of their way for customers. They are less vigilant, more likely to miss work and change jobs when new opportunities arise. They are thinking about lunch or their next break. Not engaged employees are either "checked out" or attempting to get their job done with little or no management support. The past year was exceptionally consistent in terms of tracking the percentage of engaged employees, with monthly averages staying flat for most of the year. For the majority of 2015, monthly averages hovered between 31.5% and 32.1%. The months of February and December were the lone standouts with averages of 32.9% and 32.8%, respectively. Gallup finds that employee engagement does not follow a seasonal pattern, and the months of February and December are not historically associated with higher levels of engagement. Just as there was little movement in the percentage of engaged employees from 2014 to 2015, there was little change in the percentages of not engaged and actively disengaged employees. In December, 50.3% of employees were not engaged, while 16.8% were actively disengaged. These figures are similar to readings for the prior 11 months of the year. Compared with prior years, monthly engagement averages were more consistent in 2015. Monthly averages did not drop below 31.5% in 2015, while it has been common to see these averages regularly fall below that percentage in the past. 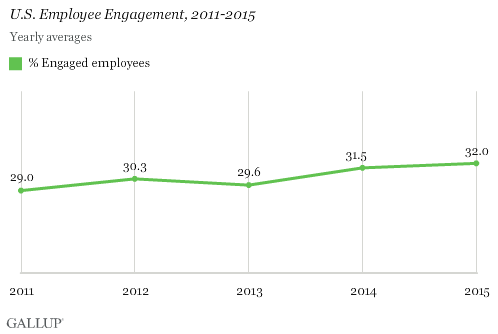 In 2014, for example, employee engagement tracked below 31% for several months. 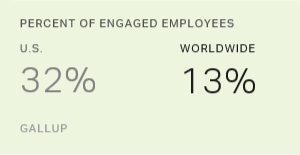 Employee engagement entered a rather static state in 2015 and has not experienced large year-over-year improvements in Gallup's 15-year history of measuring and tracking the metric. Employee engagement has consistently averaged less than 33%. Gallup has found numerous factors that have led to stagnating levels of employee engagement. First, the definition of "engagement" varies from company to company, with some measures more closely gauging favorability or happiness, which have limited utility in improving performance outcomes. Companies also fall into a common trap of mistaking their survey for an employee engagement strategy. Taking employees through a set of survey questions does not lead to improved engagement. Organizations have to approach employee engagement as an ongoing human capital strategy and consider all of the elements that matter in performance management -- from leadership accountability and manager education to clear role expectations and employee development opportunities. Results for this Gallup poll are based on telephone interviews conducted January to December 2015, on the Gallup U.S. Daily survey, with a random sample of 80,844 U.S. adults employed full or part time for an employer, aged 18 and older, living in all 50 U.S. states and the District of Columbia. For results based on the total sample of employed adults, the margin of sampling error is ±0.5 percentage points at the 95% confidence level. All reported margins of sampling error include computed design effects for weighting. In the U.S. and globally, employee engagement numbers haven't budged in years. Is there anything leaders can do?